The design responds to the client’s admiration for traditional South East Asian dwellings. Nevertheless, it is cogniscant of the contemporary Darwin context. In the same way that the Bali courtyard house offers refuge for the family from a bustling urbanity, this dwelling creates a tropical sanctuary in an ostentatious new bayside development for the well-to-do. 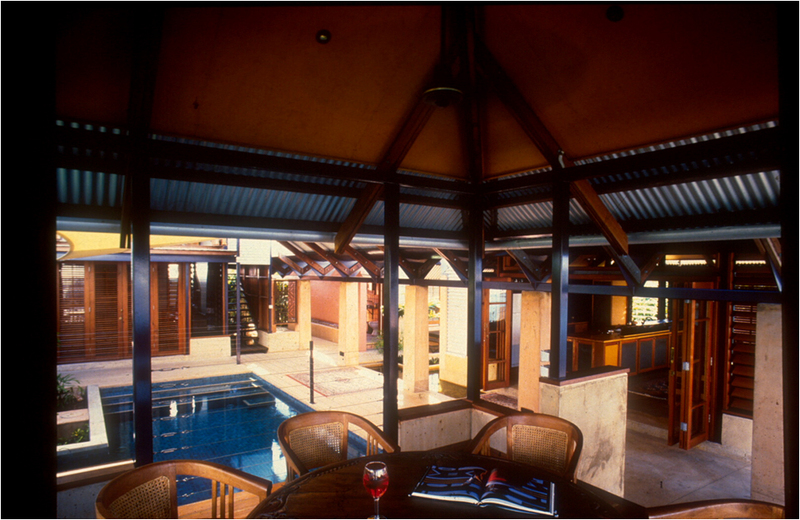 This is achieved, again as in the Bali courtyard house, by a whole-of-site approach to design. From the ‘garden wall’ entry, the visitor is seduced to explore the house along a movement spine with glimpses into the living areas and to the marina beyond. This ‘ever-on’ journey is accompanied by a series of ponds and a swimming pool. The dwelling merges outside and inside, blurring the tradition of enclosed dwelling and surrounding garden. The arrangement of the pavilions around the swimming pool contributes to a sense that the pool forms another living space. It is a private focus for the residence and is an important part of everyday living. The omnipresent water bodies within the site, and Cullen Bay beyond it, provide a serene and cooling theme throughout. The materials palette is sympathetic with the landscape, and will in time contribute to a sense of ‘aging gracefully’ within that setting. The aromatic warmth of western red cedar, recycled hardwoods and the earthiness of the ochre oxide finish to the off-form concrete provide a counterpoint to the more industrial and constructionally pragmatic elements of steelwork and ripple iron. The project had a limited budget, but also high ambition. These apparent opposites were manageable because of the clients’ intimate involvement with the creation of this very personal expression. "THIS is Darwin, with a dreamy tropical climate where walls don't need to keep heat in or out, just modulate the light and support enveloping roofs to deflect the rain. Thiel House blurs the distinction between interior and exterior, a cluster of five pavilions like a small village or a traditional Bali courtyard house compound. From the entrance gates we can see right through the house, along a row of columns and under the main gutter. These columns and one boundary wall are heavy concrete construction, pigmented in rich earth tones. Over and around this heavier base dances a lightweight post-and-panel building. Some panels are corrugated iron, some glass, some timber slats, and there are no walls at all to the raised 'dining pavilion' overlooking Cullen Bay or the back of the bathroom with its own lush courtyard. In the Wet, rainwater pours from the roofs into the central gutter, dropping to fill small ponds in the concrete base slab or cascading over the end into the bay. One of these ponds is larger and deeper, a shaded swimming pool sparling at the core of the house."